Alpha Alpha Rho Chapter | Leadership, Friendship, and Service. We, the brothers of Alpha Phi Omega, Alpha Alpha Rho Chapter, are a nationally organized fraternity. We are devoted to developing leaders and dedicated to helping others in the community through responsible and respectable service. We provide opportunities for members to develop values and skills that reflect our motto through community outreach and constant training opportunities while meeting brothers and forming strong bonds of brotherhood that stand the test of time. “Be a leader, be a friend, be of service” is a standard each member strives to achieve. Alpha Phi Omega is a national, co-ed service fraternity that has set the standard for college campus-based volunteerism since 1925. We have active chapters on over 350 campuses, and we strive to help each individual member develop leadership skills, experience friendship on many levels and provide service to others. For more information about Alpha Phi Omega, click here. If you have any questions please feel free to contact us at apouiw@gmail.com. 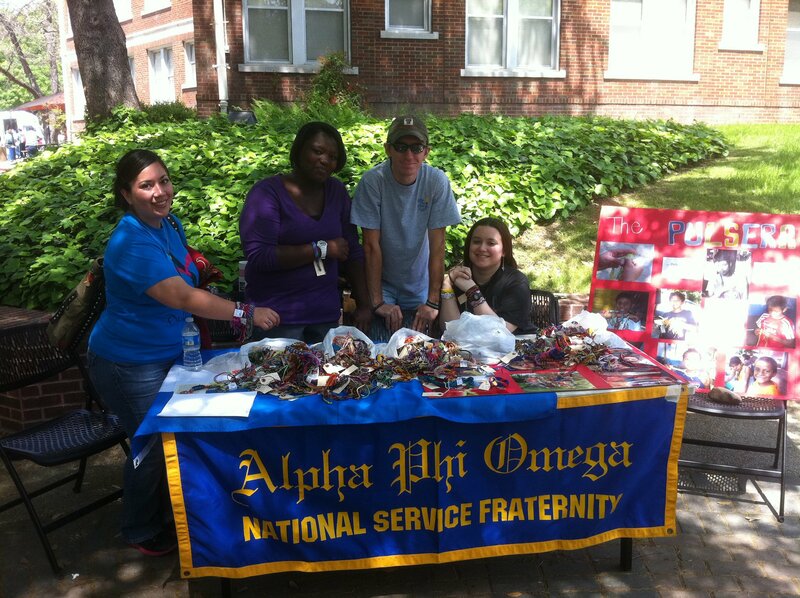 Brothers of Alpha Phi Omega selling pulseras.